Thank you for visiting the Pierce County, Georgia, website. Pierce County is nestled in southeast Georgia and provides residents and visitors with a beautiful rural atmosphere year-round. Whether blooming with the promise of spring or set ablaze with the colors of fall, the beautiful farmland and small town atmosphere that make up our county are a sight to behold and are full of natural wonders to be discovered. The Alabaha River takes a winding course through the county, creating wonderful fishing and plenty of opportunities for outdoor entertainment. A peaceful small-town atmosphere offers a haven from the hustle and bustle of contemporary life, and the sense of community here is as old and as strong as the land itself. We have friendly, hardworking residents who are proud of their heritage while looking toward the future with hope and initiative. Whether you are looking for a scenic place to visit, a hometown in which to raise a family, or a willing community in which to locate a business, you are welcome in our county. Number: 72031 | Date: 12/06/2007. 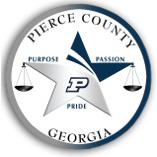 Pierce County, established in 1857 and named for President Franklin Pierce, grew out of Appling and Ware counties' lands. The county seat, Blackshear, bears the name of General David Blackshear who fought Indians in Georgia and Florida during the War of 1812. We appreciate your interest in Pierce County, Georgia, and hope this site proves useful in providing information about the Board of Commissioners, local government, and our community. Should you have questions, please contact us at: 912.449.2022.